The rotor employed in the 3-phase induction motor may be any one of the two types. 2). slip-ring or wound rotor. 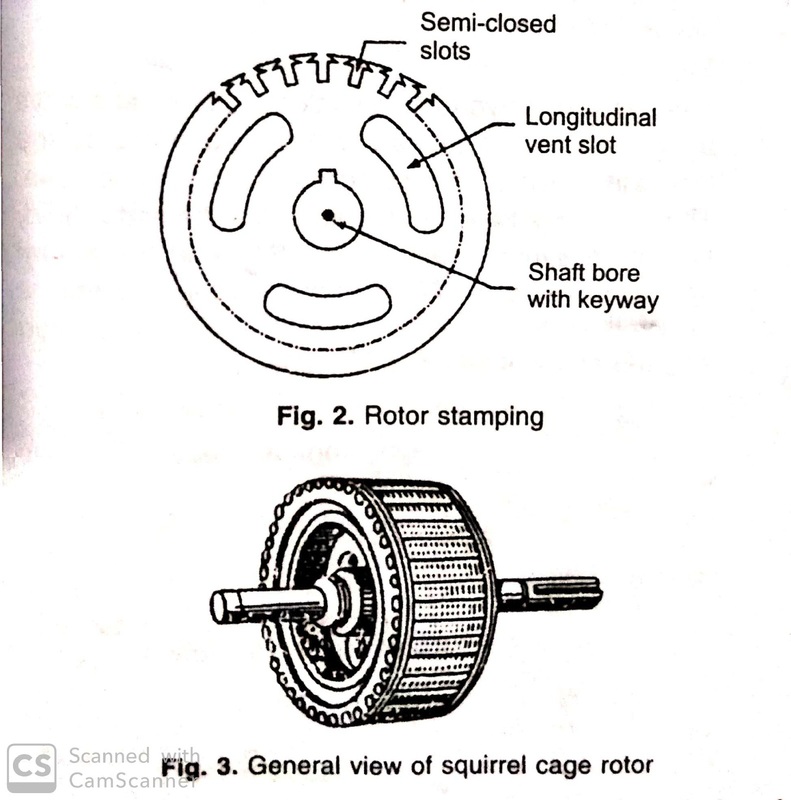 Squirrel Cage Rotor— Almost 90% of the induction motor is a squirrel cage type because this type of rotor has the simplest and most rugged construction imaginable and almost indestructible. The rotor consists of a cylindrical laminated core with parallel slots for carrying the rotor conductors i.e., Consists of heavy bars of copper aluminum or alloys. One bar is placed in each slot, Rather the bars are inserted from the end when semi-closed slots are used. The rotor bars are permanently short-circuited on themselves. Hence it is used not possible to add any external resistance in series with the rotor circuit for starting purpose. At each end of the rotor, the rotor conductor is all short-circuited by continuous end rings of similar material to that of the conductors. 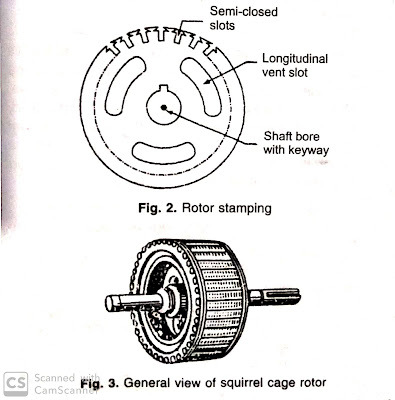 The rotor conductors and their end ring from a complete closed circuit in itself, resembling a squirrel cage. Thus explaining the name. the slots on the rotor are always not parallel to the motor shaft but are usually skewed in order to obtain in more uniform torque and reduce the magnetic humming noise while running. Another form of rotor consists of a solid cylinder of steel without any conductors or slots at all. The motor operation depends upon the production of Eddy currents in the steel rotor. In a small motor and another method of construction is used. It consists of placing the entire rotor core in a mold and casting all the bars and end rings in one place. The metal commonly used is an aluminum alloy. Slip ring Or Wound Rotor— As the name implies, such a rotor is wound with an insulated winding similar to the stator winding and for the same number of poles as that of the stator. The rotor winding always 3-phase winding, Even when the stator is wound for two phases. This types of the rotor are provided with 3-phases, Double layer distributed winding consists of coils as used in alternators. The 3-phases are star-connected internally. The other three winding terminals are brought out and connected to three insulated slip rings made of high-quality phosphor bronze, Mounted on the shaft with brushes resting on them. the three brushes are further externally connected to a 3-phase star connected rheostat. This makes possible the introduction of additional resistance in the rotor circuit during the starting period for increasing, The starting torque of the motor and for changing its speed torque/current characteristics. The slip rings are automatically short-circuited by means of a metal collar when running under normal conditions, Which is pushed along the shaft and connect all the rings together. The brushes are automatically lifted from the slip rings to reduce the frictional losses wear and tear, under normal running conditions the wound rotor is short-circuited on itself just like the squirrel cage rotor. As shown in the figure. 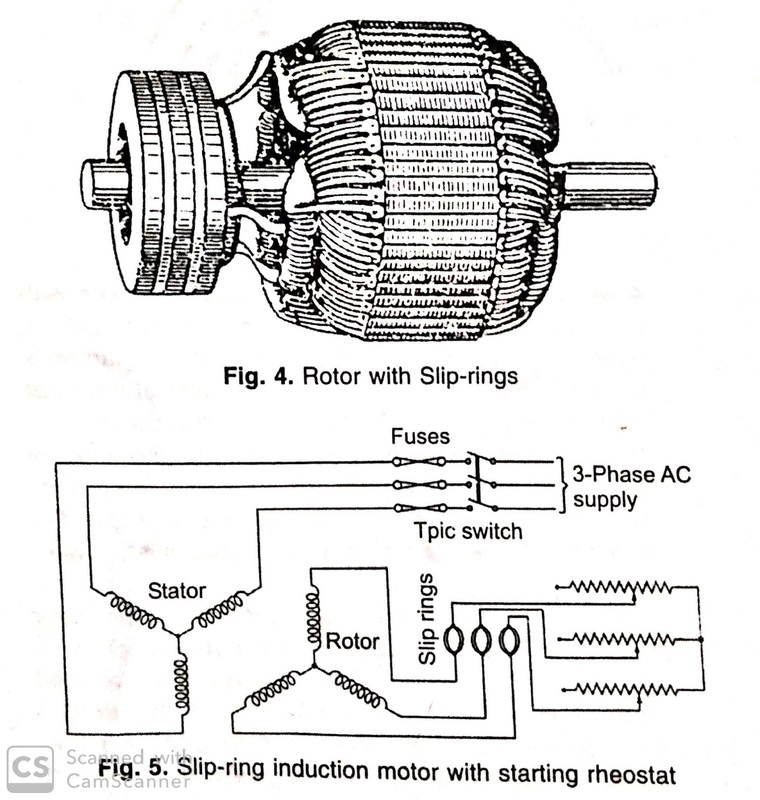 When the stator or primary winding of a 3-phase induction motor is connected to a 3-phase A.C. supply, The rotating magnetic field is established which rotates at synchronous speed. The direction of revolution of this field will depend upon the phase sequence of the primary currents and therefore will depend upon the order of connection of the primary terminals to the supply. The direction of rotation of the field can be reversed by interchanging connection to the supply of any two leads of a 3-phase induction motor. Where "f" is supplied frequency and "p" is the number of poles on the stator. The revolving magnetic field produced by the primary currents sweeps across the rotor conductor and thereby induces an e.m.f. in these conductors. Since the rotor winding is either directly shorted or closed, Through some external resistance, The e.m.f. Induced In the secondary by the revolving field causes a current of to flow in the rotor conductors. 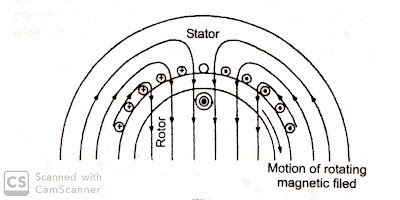 Section of an induction motor stator and rotor, with the magnetic field, Assumed to be rotating in a clockwise direction and with the rotor stationery as its starting is shown in the figure. The Relative motion of the rotor with respect to the stator field is anticlockwise. Now by applying the left-hand rule or by the effect of combined field, it is clear that the rotor conductors show experiences a force tending to move the conductor to the right. Only one conductor is shown for simplicity. However, Other adjacent rotor conductors in the stator field likewise carry current in the same direction as the conductor show and also have a force exerted upon them tending to move them towards the right one half cycle later, The stator field direction will have reserved but the water currents will have also reversed, So that the force on the rotor is still the same. An induction motor running at no load will have a speed very close to the synchronous speed and therefore e.m.f. in the rotor winding will be very small. This small e.m.f. Gives a small current producing a torque just sufficient to overcome the losses such as due to friction and maintain the rotor in motion. As the mechanical load is applied on the motor shaft, It must slow down because the torque developed at no load will not be sufficient to keep the rotor at the "no-load speed" against the additional opposing torque of load. As the motors slow down, the relative motion between the magnetic field and the rotor is increased. This result in greater rotor current and greater developed torque. Thus as the load is increased, the motor slows down until the relative motion between the rotor and the rotating magnetic field is just sufficient, to result in the development of the torque necessary for that particular load.